VietNamNet Bridge – As soon as a coffee tree is planted, coffee growers would dig soil around the tree to create a hole that helps to store water and nutrition for the tree’ s growth. 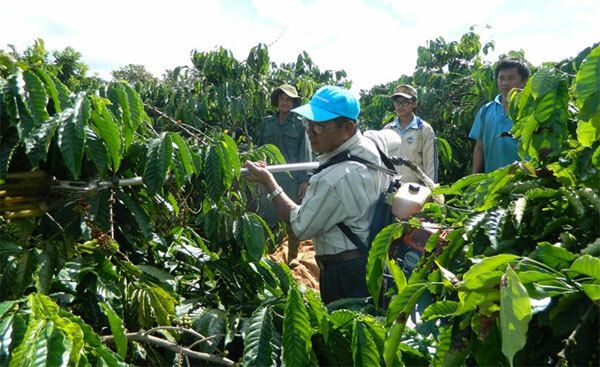 Coffee picking machine made by Do Duc Quang, an amateur mechanic in Central Highland province of Kon Tum. This farming technique called “đào bồn” and is important to make the tree roots develop strongly, improve the tree’s ability against drought and increase productivity. In the past, coffee farmers in the Central Highland province of Gia Lai did this manually but in the last ten years, they had another choice – using a machine made by a local amateur mechanic Do Duc Quang. 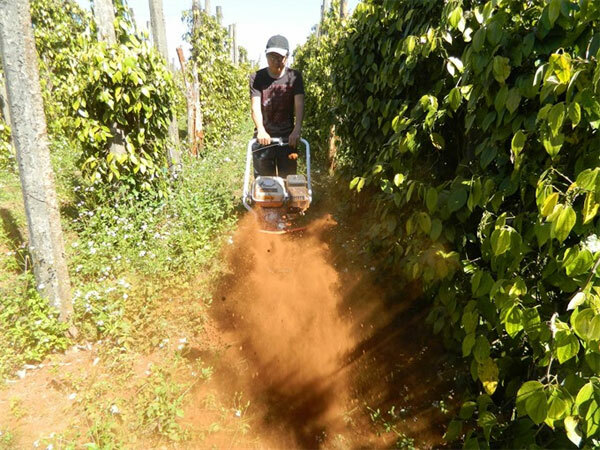 In 2008, Quang introduced his first invention – a machine that can dig soil and fertilise. “The machine can do the work of ten manual workers,” he said, adding that with the machine and about six liters of petroleum, two workers can dig 200-300 holes a day. Quang, born in the central province of Quang Nam, left his hometown 46 years ago to move to Kon Tum – a land of coffee in Vietnam, to seek opportunities of his life. He started as an apprentice in a small mechanic workshop and then, worked in a co-operative. He was assigned to fix sewing machines, lawnmowers or portable power generators. “Through the work, I have learned much about mechanics without attending any class,” he said. For years, he also learned about coffee farming, so he cherished ideas to make machines to help reduce hardship of coffee farmers. After a lot of ideas and testing, in 2008, he successfully made a soil-digging machine. “I have made and sold more than 2,000 digging machines,” Quang said, adding that his business was gradually thriving. Now, he owns a mechanic workshop in Pleiku City but he still joins every stage to produce a machine. In 2011, he invented another machine used to harvest coffee. Le Thanh Viet, a coffee farmer in Ia Tiem Commune, Chu Se District said he bought Quang’s digging machine two years ago. “I paid VND13 million for the machine and so far, it works well,” Viet said, adding that his neighbours usually borrowed his machine. “We like it. It’s five times effective than doing manually and consumes little fuel,” he added. Another farmer Le Trung Khanh from Nghia Hoa Commune, Chu Pah District said it was difficult to find workers during coffee harvest time. “With the coffee-picking machine, my family is not worried about labour shortages. The machine works fast,” he said. Quang’s son, Do Duc Sang said his father’s work had inspired him a lot to continue to upgrade the digging machine so that it can have more functions. Sang said that the latest version of the machine can be used for other kinds of trees like tea, sugar cane, mango or jack fruit. Sang said his father and he were studying to make a grass grinding machine to make fertiliser. “The machine is expected to make use of grass in garden, which cleans the garden and reduce farming cost,” he said. Director of Gia Lai Province’s Science and Technology Department, Luu Trung Nghia, said Quang’s machines were very practical and useful for farms. Quang’s machines are portable, easy to use, easy to fix as they can be disassembled easily and items to replace broken ones are available. The department planned to help Quang to establish a firm, register copyright for the machines and introduce his products at technology fairs.